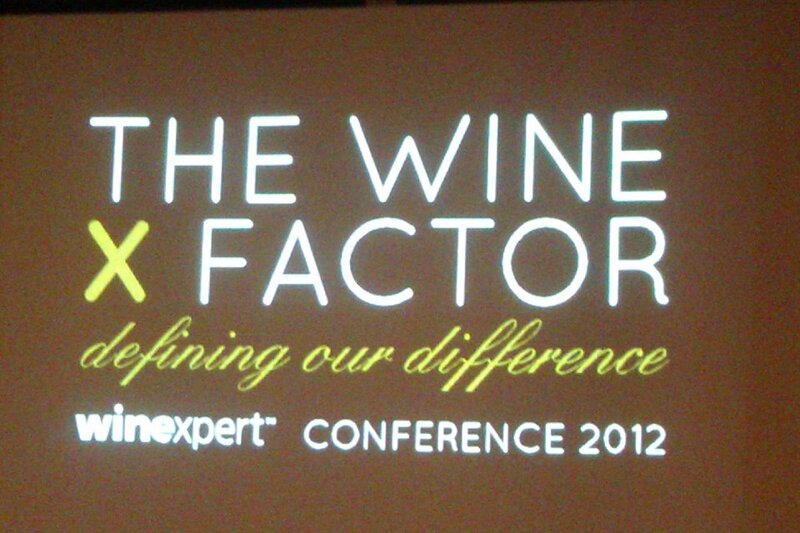 Recently Just Fine Wine attended the Winexpert Conference at the River Rock Hotel and Casino. For two days the Winexpert company and authorized Winexpert retailers from across Western Canada gathered and discussed just what it is that sets Winexpert apart as the industry leader in on-premise winemaking how we can build upon this. Fittingly, the event was titled “The Wine X Factor” and to say that there are eXtremely eXciting things happening now and in the near future is a vast understatement. From drastic improvements to all Winexpert wine kits (beginning with the new and improved, reformulated 4-6 week Vintners Reserve line which is available now); to new products; to in-store improvements; and much more . We know Winexpert is the leader in the industry on on-premise winecrafting but we don’t want to rest on those laurels. We want to continue to find ways to maintain and, more importantly, improve your experience both in-store and at home with the wine you make with us. What a great weekend. We closed up the shop a bit early on Saturday and the Just Fine Wine gang made our way to the Delta Burnaby Hotel and Conference Centre at the Grand Villa Casino for the Winexpert Western Canadian Retailer Conference. 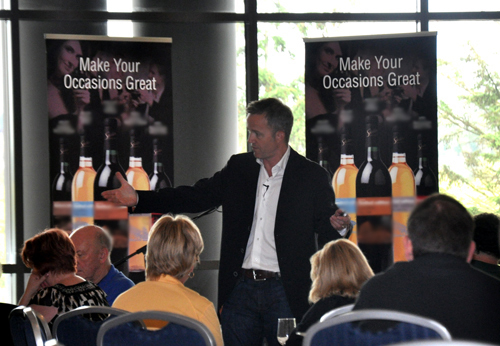 The annual event includes a Q&A with wine guru Tim Vandergrift; the Limited Edition unveiling, a wine tasting and food pairing event; and a day filled with useful workshops and information sessions. Retail Expert Kevin Graff. Photo by Tim Vandergrift. As much as we’d like to let you in on this year’s Limited Edition lineup, we’ve been asked to keep things a secret until the public release day of October 1st. At that time we’ll forward you the information immediately. Be sure to also keep your eye on the Limited Edition Website for further details and your chance to win prizes. For anyone who absolutely just can not wait, zoom in on the banners in the background of the picture we borrowed from Tim. You will see there that this year’s lineup will be “three reds and two whites” (a one liner we also stole from Tim)! Sorry, looks like Winexpert is also expert at keeping things hush hush and have already blurred out the photo. We will say that some of us were not overly familiar with some of this year’s Limiteds but after tasting the commercial equivalents – and coupling that with the knowledge that the wines we’ll have at Just Fine Wine will be so much better – we couldn’t be more excited! We’re confident you all will be as well. We still have tickets available for our Annual Wine Tasting Sunday, October 17th. Come see and taste for yourself. The aforementioned Tim Vandergrift will be there facilitating the event and he gives one heck of an entertaining presentation! Winexpert did a great job of organizing a fun and information packed weekend. For anyone booking an event or conference, the staff, facilities, and food at the Delta Burnaby Hotel and Conference Centre were top notch. We’re not sure what sort of price range they fall in but as far as quality and service goes, we wouldn’t hesitate to recommend them. Recently we made our way to Cepperley Meadow in Stanley Park to experience Fresh Air Cinema’s presentation of the classic 80’s adventure movie The Goonies. For anyone not familiar, Fresh Air Cinema is a mobile open-air movie theatre (for hire by businesses, organizations and individuals) that can set up pretty much anywhere and everywhere there is an open space. Movies are projected on to a giant inflatable screen, turning any area into an instant drive-in or walk-in theatre. 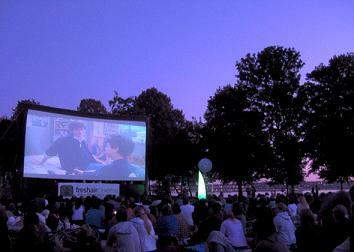 Movies begin at dusk, which on hot summer nights can be as late as 10pm. We arrived a little over an hour and a half early which was good enough to get a good (but not great) spot at the back of the park. While there were plenty of children around, the demographic was less suburban family and more urban bohemian. The vibe was friendly, laid back and the weather, in a word, perfect. Almost everyone was enjoying a picnic, pre-packed dinner, take-out, or other treats on their blankets. Several couples and groups were responsibly enjoying a (plastic) glass of wine or other beverage. While there were park authorities present they seemed unfettered by the occasional libation. There were two minor drawbacks to our experience however. Nothing that ruined our evening but things worth pointing out to anyone thinking of making this a night out. The first issue was latecomers who jammed themselves in or met up with and overcrowded their friends’ spot. Obviously space is expected to be at a premium at an event like this but when several people arrive at dusk, shoehorn themselves in and consequently impede both your personal space and view, it’s a touch impolite. Second, we were surprised at the amount of smoking. A lot of cigarettes were being lit up, some of them of the ‘wacky’ variety. The scene was almost reminiscent of a 1980’s bingo hall, except outdoors. We’re of the belief that chain smoking kind of defeats the purpose of “fresh air” cinema, but to each their own. An allergy to cigarette smoke certainly doesn’t help matters. All in all it was an enjoyable evening with a real good community feel. The crowd can get really involved cheering and reciting lines – a highlight was definitely the collective cheer that erupted when Chunk did Truffle Shuffle! While there aren’t any more films currently scheduled for Stanley Park, there are many open air cinema events taking place throughout the rest of the Summer. Arrive really early for the best choice of location for your setup. If you have a touch of claustophobia or just don’t like being in the heart of crowds, might we suggest setting up your blanket on the boulevard or grass on either side of the Beach Avenue sidewalk. If you’re checking out events at another location, search the fringe of the area especially for any rises or grassy knolls. Out there on the periphery you have a fine view of the screen; a whole lot more elbow room; and you can even get away with lawn chairs (these being frowned upon in areas closer to the screen). Don’t overdo it but bring a sizable blanket to stake your space and give yourself a bit of extra room. Pre-pack a picnic dinner or snack and be sure to bring along a nice pre-chilled Selection Original White Zinfandel or Estate Series Washington Yakima Valley Pinot Gris. 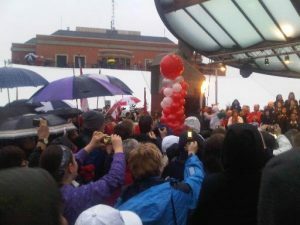 This morning we braved the rain and relatively early hour to join thousands of our neighbours at the Port Coquitlam leg of the 2010 Olympic Torch Run. It was amazing to see people young and old lined up at least 5 deep (perhaps more) on either side of Shaughnessy Street as well as a jam packed band stand area at Leigh Square. 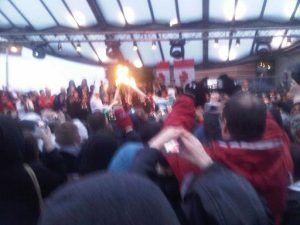 The weather had no affect on the jovial mood and the torch came in blazing. Whatever your political viewpoint on the games, one must feel proud to see such a positive display of community spirit and patriotism. We sure are! Go Canada Go! We’re celebrating until February 22. Take advantage of our special offer on award-winning wines. 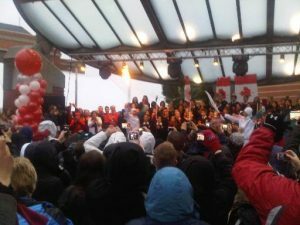 Click Here to see watch the torch’s arrival in downtown Port Coquitlam. We noticed a demand for Thursday night bottling appointments so we’re altering our hours to serve you better. Effective March 1st, 2010 the shop will be open from 11am to 8pm on Thursday. On Mondays our hours will now be 10am to 5pm. much happiness this Holiday Season and prosperity in the New Year. Thank you for your patronage and loyalty. We look forward to seeing you again in the new year! Just Fine Wine is extremely excited to present to you our new and very much improved website! 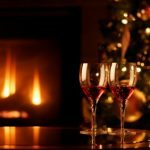 The new JUSTFINEWINE.CA is your complete wine-lifestyle resource, available at your fingertips 24/7. You’ll be able to access recipes, food pairings, wine ideas and more! The entire site will have regularly updated content from both Just Fine Wine and Winexpert which will keep your visits fresh and interesting. This new site has been designed to be more interactive. The Product Page has a “Detailed Wine Search” which links directly to Winexpert’s databanks. You can easily pair yourself up with wines that specifically suit your palate! The site is still a work in progress. In the coming months we will be implementing a “Check Your Wine” feature, allowing you to keep up to the minute data on your wine’s development. You can request a future order and also set-up / view / change / or request notification of a bottling appointment…all from the comfort of your own PC! We are very happy to provide you with this cutting-edge online tool and hope that the new JUSTFINEWINE.CA will further improve your overall experience with us.